Before receiving a duvet from The Fine Bedding Company, I naively thought all duvet’s were the same. I never really spent much time looking at them and bought whatever one was on offer when I needed one. I now admit I was wrong, so wrong. This duvet has me sold on you need a good duvet from a reputable company. I am always too warm when I use anything more than a 4.0 tog duvet, yes really. My husband however is always freezing. We were sent a Breathe 10.0 tog King duvet. When I saw the tog, I thought I’m going to fry under this. I put it in the cover and it actually fitted the cover perfectly. You know when you have a cover there is always the bits at the side that don’t have any duvet in them, not with this duvet they don’t. The first night I slept under this duvet it was what I imagine sleeping under a big fluffy cloud is like. It was so thick, yet so light. I could toss and turn and the duvet was still on top of me. I was also amazed I wasn’t roasting, it was just right. I know it sounds cliché but I really am amazed at this duvet and love it. I will never go back to just an off the self, whatever is on offer duvet again. I’m sold on this and the prices are very responsible too. The duvet comes in a fab zip bag which is well made and can be reused, I stored our spare one in it. The duvet is also washable which is great. You can wash it at 60°C if I can’t fit it in the washing machine, there’s a laundrette not far. 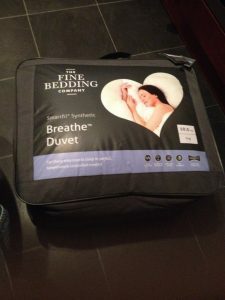 I am in love with The Fine Bedding Company, the Breathe Duvet is a dream to sleep under and I cannot recommend this highly enough. I am doing to buy the boys their duvets from here too. Don’t forget to follow The Fine Bedding Company on their Website, Facebook, Twitter, Pinterest and Google+ for up to date information and offers.